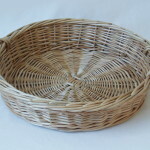 There are almost endless possibilities for making fruit baskets and round trays. Here are just a selection. 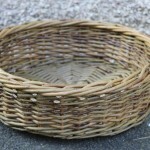 All made from the natural colours of willow we have available – buff, natural white, green and steamed (dark brown). We can make them to the size that fits your space. 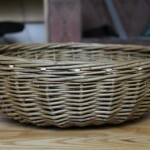 We can also make fruit or vegetable baskets to fit into corners, if you need to utilize your worktop space effectively. They are ideal as gifts for weddings or anniversary – you can load them up with fruits or sweets or cake or a selection of goodies as a Christmas hamper. 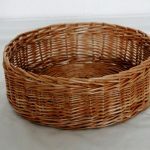 For our friendly, professional advice and to discuss your basket requirements, please email or call Alison on 01294 829012. 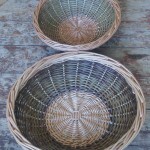 Have a look at the gallery page for inspiration from our customer photographs. The custom made options page gives information about the various styles of weave and border and colour combinations. 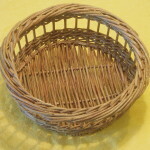 We love making baskets to order. It’s special because we’re making it just for you – no-one else, whether it’s a little fruit basket or a moses basket. There’s no production line, nothing off-the-peg. 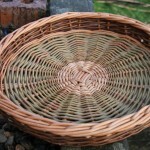 Everything handmade to order and it means you can have your basket how you want it at incredibly reasonable prices, for a product handmade in the UK. The willow we use comes from a sustainable source, grown on the Somerset Levels where willow has been grown for generations. 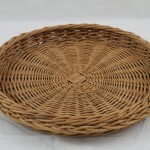 Willow is a very fast growning crop and is harvested annually. The base of the plant remains and new shoots are produced year after year. Many customers tell us how fantastic it is to be able to have something made just the right size and shape and colour for them.